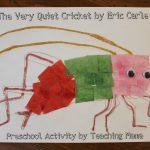 Yesterday I shared our caterpillar and butterfly crafts. 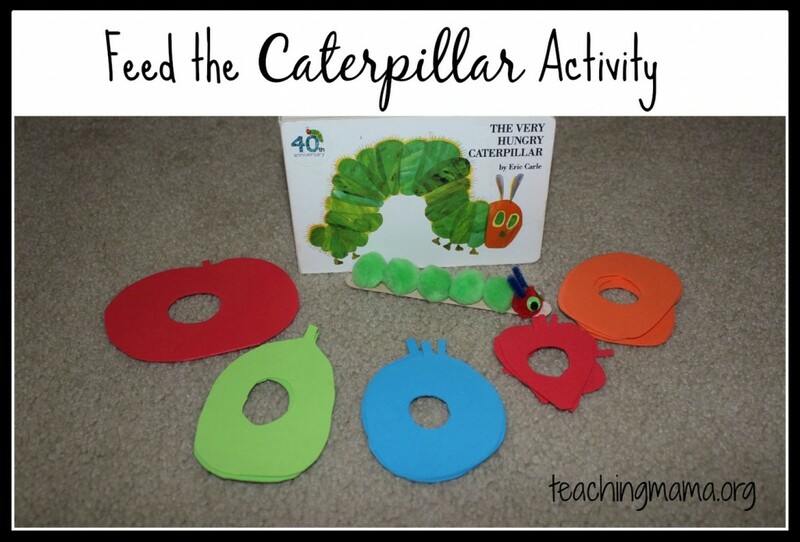 Today I am sharing our Feed the Caterpillar Activity, which is a great activity for toddlers. 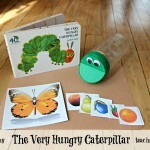 In The Very Hungry Caterpillar book, the caterpillar is so hungry that he eats 1 apple, 2 pears, 3 plums, 4 strawberries, and 5 oranges and then he eats a bunch of junk food before finishing off with a big green leaf. 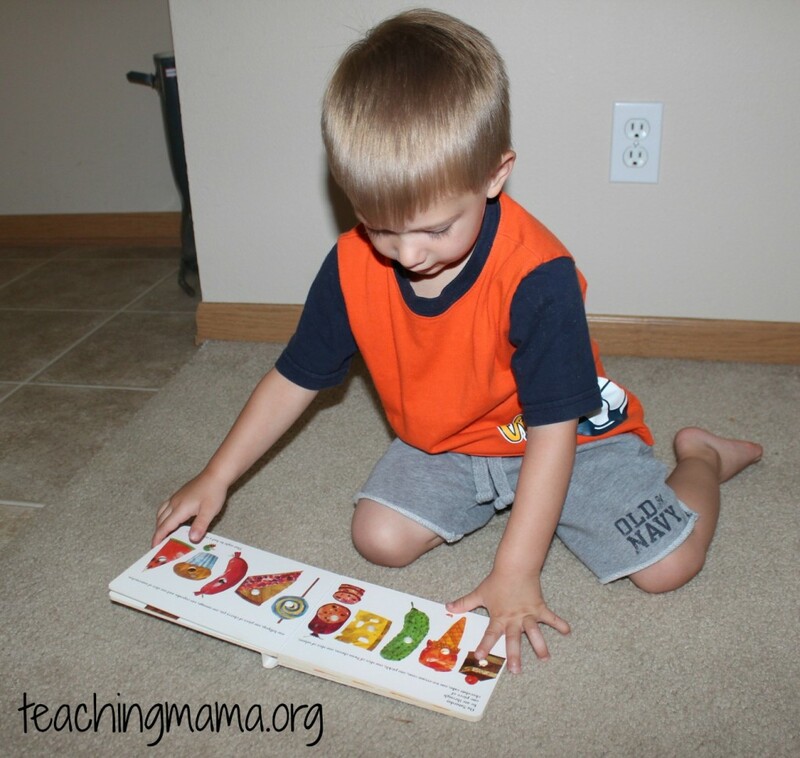 In this activity, the child will feed fruit (foam pieces) to the caterpillar. 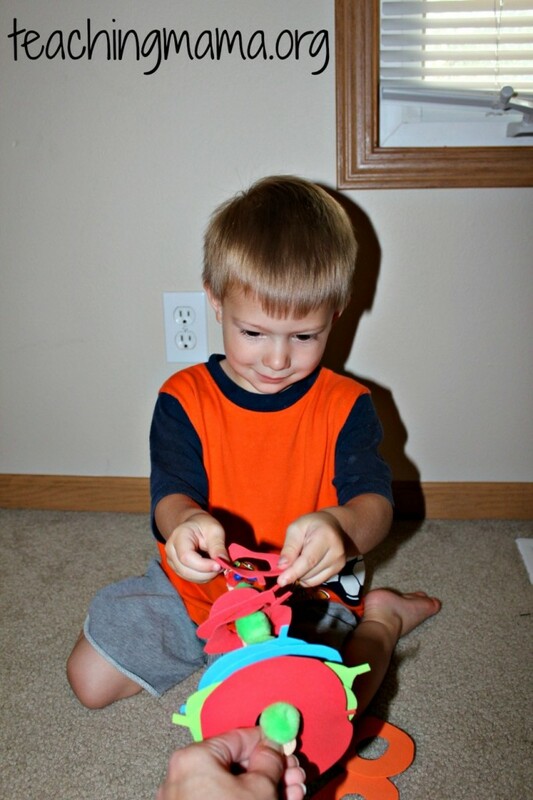 This is a good movement activity and involves using both hands and moving one object in one hand to the other hand. It’s also a way to practice retelling the story. 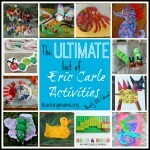 And the added bonus is that little ones like doing this activity! For the activity, you will need to cut out foam in the shape of the fruit. Also make sure to cut a hole in the fruit so it will fit onto the caterpillar. You will need a caterpillar, like the one we made here. 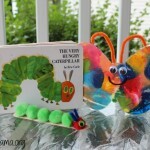 Next, read through the story and have your child feed the caterpillar with the foam fruit (in the order shown in the book). 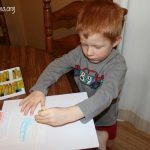 You can also practice counting with this activity. I did not make any of the junk food, but we talked about the food in the book. Then we finished by going through what happens after the caterpillar is full! He wraps himself up in his chrysalis and finally turns into a beautiful butterfly! We also did an egg to butterfly activity using gross motor skills. 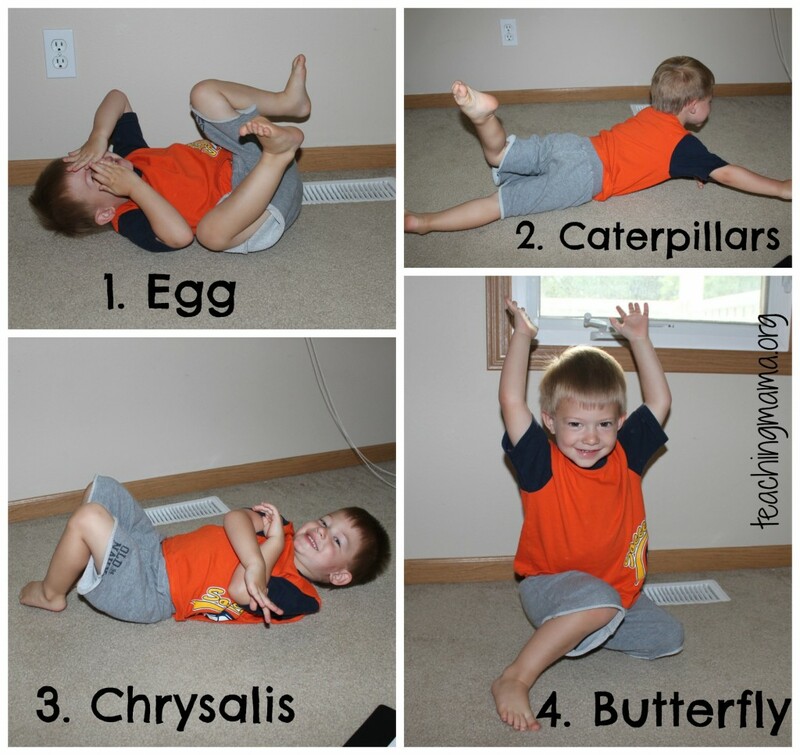 I had my toddler act out the stages of the butterfly. 1. Make yourself as small as you can, becoming a tiny egg under a leaf. 2. Now hatch out of your egg and become a catperillar. 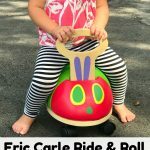 Move around the floor like a caterpillar! 3. Next you wrap yourself into the chrysalis. Lay as still as you can. 4. Finally, break out of the chrysalis and fly around like a butterfly! 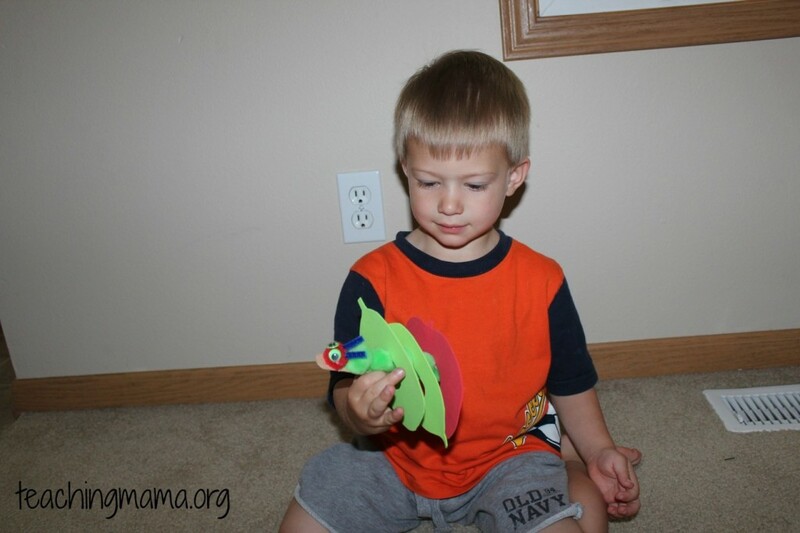 It is a very simple activity, but it helps kids learn the life cycle of a butterfly and it’s always great to use movement to learn! Lastly, I wanted to share two printables we used to talk about the life cycle of a butterfly. I love creating printables, but sometimes there’s no need to recreate what’s already out there! 1. We printed and put together this Life Cycle of a Butterfly Printable Booklet. We read it and also colored the pages. 2. We also went through these lovely butterfly printables. We especially liked the sequencing cards!